This buddha bowl has it all… lean protein, whole grains, and nutritious veggies! 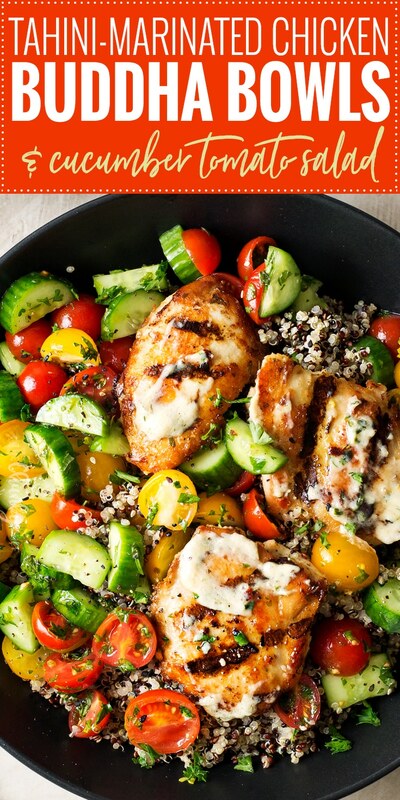 The cucumber and tomato salad compliments the tahini chicken perfectly! If you think eating healthy has to be boring and bland, you definitely need to try this buddha bowl. 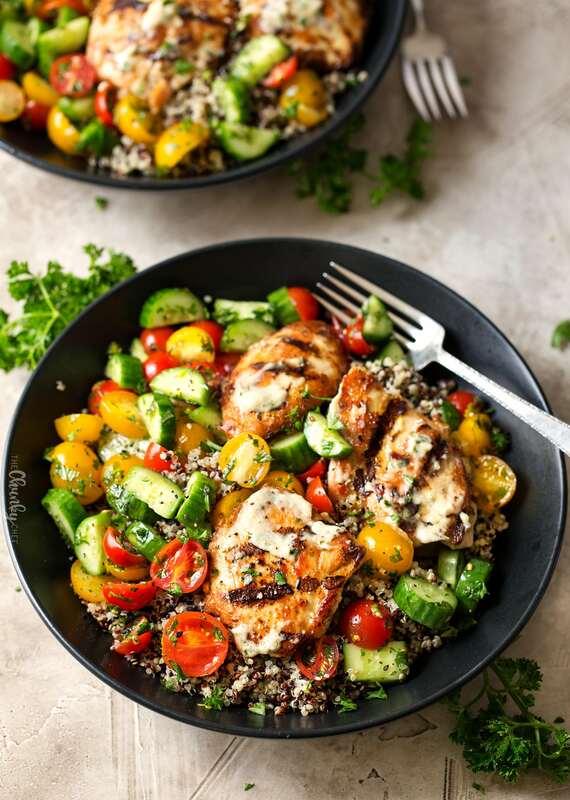 Tahini marinated chicken thighs (can use breasts if you’d prefer), healthy tri-color quinoa, and a mouthwatering cucumber and tomato salad… eat the rainbow, and love how it tastes! Here on the blog, I like to share a lot of comfort food, appetizers, and desserts… but not a lot of healthy meals. Which is kind of ridiculous, because despite being the chunky chef, we actually eat fairly healthy most of the week for dinner. So when I spotted this recipe in an issue of Cooking Light, I knew I’d have to try it out for myself (and of course, share it with all of you!). One thing I love about this buddha bowl, aside from the fun name, is how easy it is to change things up to fit your tastes! In place of the tricolor quinoa, feel free to use any grain you like. 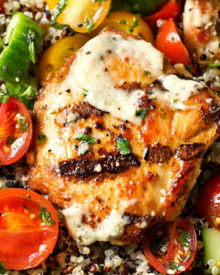 And in place of the chicken thighs, you can use chicken breasts, or even try different proteins like pork or turkey! 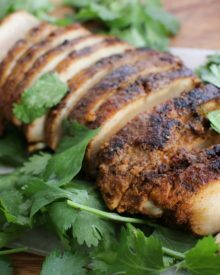 I personally love using the boneless skinless chicken thighs for several reasons. 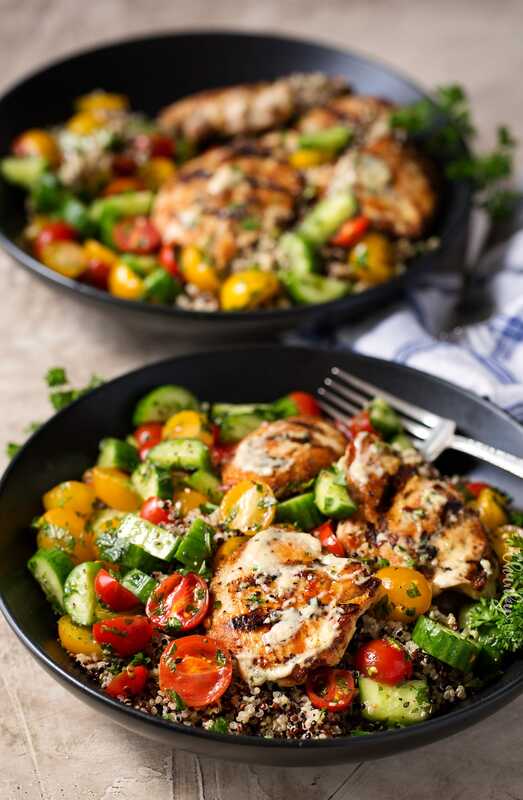 You could also switch it up and turn the marinated chicken into kebabs, served on the bed of quinoa and cucumber tomato salad. Sometimes, a kebab gives things a perfect summer touch! Speaking of summer, that colorful cucumber tomato salad is the PERFECT way to take advantage of the amazing summer tomatoes that are in season right now. I used a medley of ripe cherry tomatoes and sweet gold tomatoes, for amazing flavor as well as a pretty color palette when combined with the crisp green cucumbers! You’ll love the crisp, fresh flavors of the cucumber tomato salad… so full of herbs. It’s actually pretty amazing on it’s own, as a side dish… so feel free to make extra and save it for another meal! 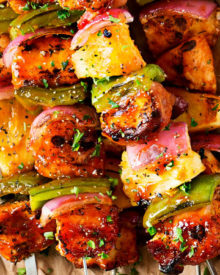 Actually you should serve it alongside these Grilled Steakhouse Kebabs… the flavors are great together! It’s hard to get a completely accurate calorie count on these, because most nutritional calculator assume all the marinade will be consumed, when most of it is actually discarded… but I would say these are pretty darn healthy and full of nutrients! Oh, and if you have any tahini paste leftover, whip up this fantastic Roasted Garlic Hummus (made in minutes in the food processor!). WANT TO TRY THIS TAHINI CHICKEN BUDDHA BOWL? PIN IT TO YOUR HEALTHY OR DINNER BOARD TO SAVE FOR LATER! This buddha bowl has it all... lean protein, whole grains, and nutritious veggies! 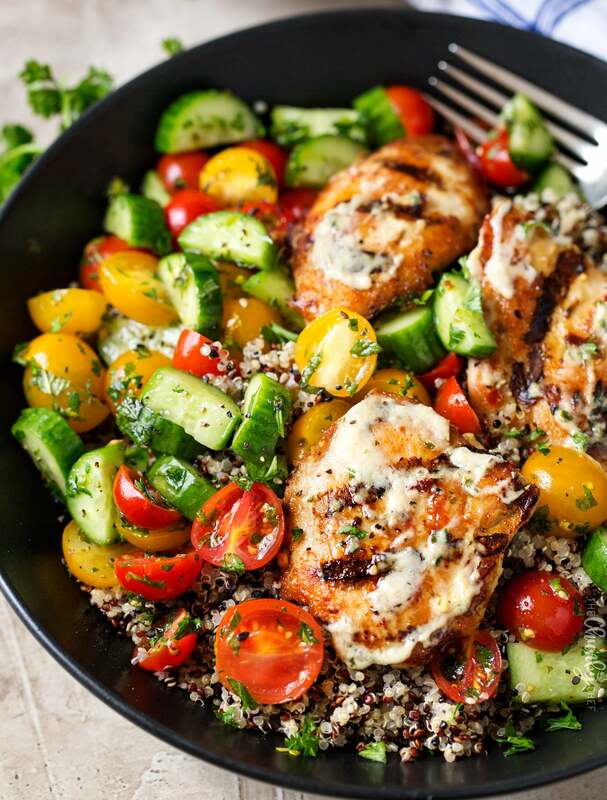 The cucumber and tomato salad compliments the tahini chicken perfectly! Combine marinade ingredients in a large resealable plastic bag. Remove 1/4 cup of marinade and place in an airtight container and refrigerate. Add chicken to plastic bag, seal tightly, and massage to coat chicken in marinade. Refrigerate 4 hours, up to overnight. Remove plastic bag from refrigerator while preheating grill (or a large skillet) to MED. Set container of reserved tahini marinade on the counter to come to room temperature. Lightly oil grill grates and gently pat excess marinade from chicken. Grill chicken about 4 minutes per side, until cooked through, and remove to a plate. Add all cucumber tomato salad ingredients (except quinoa), in a mixing bowl, tossing to combine. 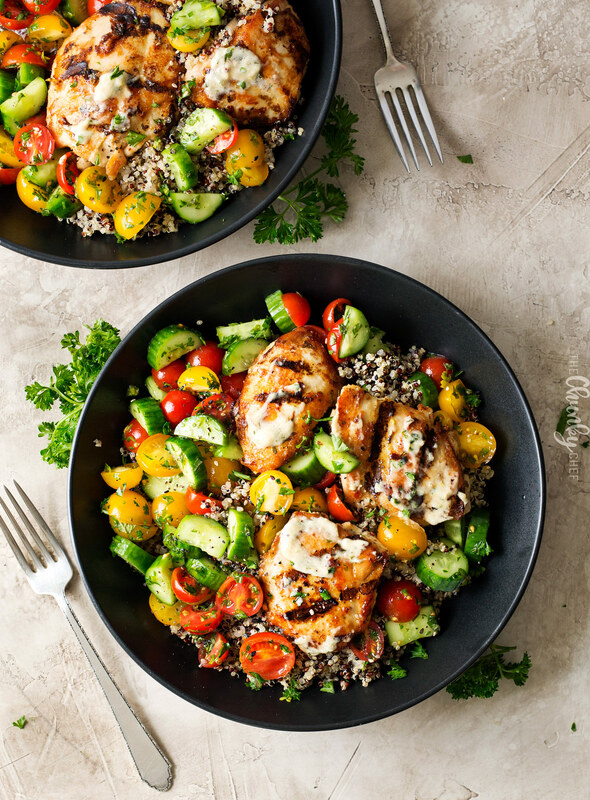 To serving bowls, add 1/2 cup quinoa, 1/2 cup salad, and 2-3 chicken thighs. 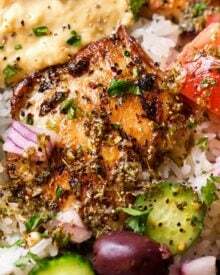 Drizzle with reserved tahini marinade and serve! Separate cooked quinoa among several meal prep containers (I like these!). Arrange quinoa on one side of the container, and tomato cucumber salad on the other. Lay the chicken over the top. Divide leftover tahini sauce and pour into condiment cups with lids (these are great), and add one to each meal prep container. Refrigerate until ready to heat and serve. TOTALLY loving this! Something healthy that aaactually tastes good too. Can’t wait to try this out! Oh my! This looks so good! I love all the colors! I think my favorite part about this recipe is the name. Memorable! I agree with you on chicken thighs; they are my favorite! We are eating healthier and lighter right now, so I totally plan to add this to our menu! Wow. I’m blown away by these bowls! They are beautiful and that tahini! Loving the cuke/tomatoes over the tops – really nice! I love everything about these bowls. They look absolutely delicious! This looks so delicious! I’m think even my picky eater would love this for dinner! Sometimes even “light” meals are comforting. Looks delish!